These invisible height increase insoles are unique - because they can be worn inside your socks, making them invisible when you take your shoes off. These are extremely comfortable shoe lifts - having the ability to mould comfortably to the shape of your foot. Very durable with a long product life . They are also used to reduce pressure on the back and knees when walking, which is clinically proven to effectively reduce spinal shrinkage with age. This invisible height increasing insole is recommended for an added lift to increase your height, leg length discrepancy and arch support. The material of the surface of the main soles is synthetic velvet. 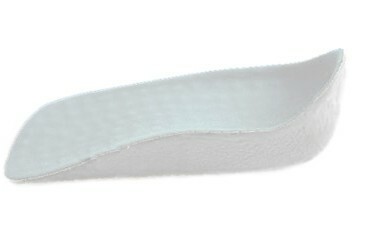 The bottom of the main sole is made of white foam. My item came in exactly an hour ago and I couldn't wait to try them out and see how they were. Fits greatly in socks and aren't hardly noticeable at all! Comfortable as ever but it'll take me a few days to get used to. I actually think I'll wear these forever !